LADY AT THE BAT: Who's Running This League, Anyway? Who's Running This League, Anyway? First a league official visits the Red Sox Dugout in the middle of a game to make sure Terry Francona's wearing his uniform top. Then there's umpiring crew chief Derryl Cousins: "There is more than a little bit of history between these clubs," he said. 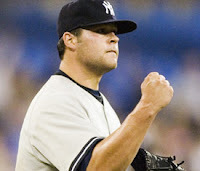 "Those were two pretty nasty pitches [Joba Chamberlain] threw. Up here, you need to be a little better throwing strikes, and we just had to put a lid on it before there was a problem." Peter Gammons brought both of these issues up this morning on Mike & Mike In The Morning. Gammons wondered whether the League offices are being run by people who know nothing about baseball. I think I agree with him. Why send someone to check on what Francona's wearing in the middle of an inning??? Also, why eject a 21-year old pitcher with less than 20 innings in the Big Leagues without warning him first? Cousins' statement makes no sense anyway. If Joba needs to be "a little better throwing strikes" doesn't that mean he thought Joba had no control and, hence, wasn't throwing at Kevin Youkilis? Joe Torre thinks the umps need to apply more common sense. Hmmmm. Wake me when that happens.